YOUR AUTOBIOGRAPHY takes on the large issues of war and espionage, ethics and theology, identity and family. Kelly Cherry’s travels to Russia began in 1965, where she met a Latvian and the two tried to marry but authorities refused to allow it. In YOUR AUTOBIOGRAPHY, reference to earlier wars (e.g. Vietnam, Syria) leads to Bonhoeffer’s battle with the Nazis on behalf of his church. The poet’s responses to Bonhoeffer’s statement allow a dialogue to form from different points of view. That dialogue leads to a sequence about the author’s sister and various “family or domestic wars.” Now that Cherry is the only one left standing, she wishes she could bring them all back, and tries to do so in this book--her sister especially. The collection ends with Cherry’s translation of THE FORTUNES OF MEN, which examines how God, perhaps better called Lady Luck, plays her cards. 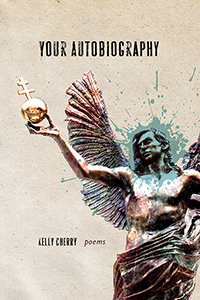 Cherry’s poetry takes the reader on a journey of self-introspection and self-examination. Her words permeate a reader’s being in multiple ways both emotionally and intellectually.